I made this tonight for Sophie and myself because we were both craving something warming and comforting. This is a twist on a childhood classic (tuna and pasta in cheese sauce) that my sister made religiously every Monday for about 5 years when we were at school. 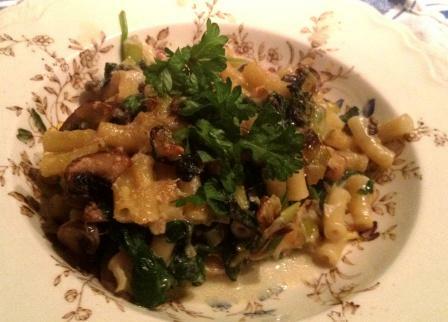 You can mix it up with what you have lying around, but my favourite ingredients are spinach and mushrooms. Pre-heat your oven to 170˚C. First, cook your pasta according to manufacturer’s instructions. While the pasta is cooking, prepare your other ingredients. Heat a dash of oil in a frying pan, and fry the onion until transparent. Next, add the garlic and cook until just fragrant. Then chuck in the mushrooms, stir, cover and lower the heat until the mushrooms are soft. Remove the pan from the heat, add the spinach and cover again. Leave until you have made your white sauce (next step), by which point the spinach will be bright green and wilted. Next, make the white sauce. Melt the butter in a medium-sized saucepan, then begin to add the flour a little at a time, stirring constantly, until you have a paste. Add a splash of milk and stir with a hand whisk. Add the milk a little at a time, until the flour-butter paste has dissolved and there are no lumps. Crush in your stockcube, and keep whisking until dissolved. Then add the mustard and keep on whisking. You’ll need to keep heating and whisking the mixture until it begins to thicken (usually takes about 10 minutes). If it doesn’t thicken up, try adding a bit more flour. Once it begins to thicken, toss in most of the grated cheese and switch to stirring with a spoon until the cheese has melted. Then remove from the heat. 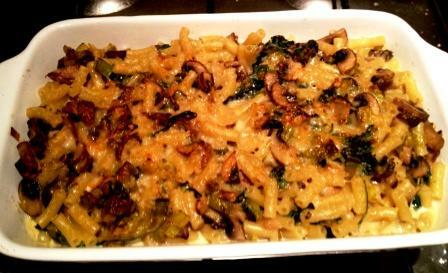 Once the pasta, sauce and mushroom-spinach mixture are ready, combine them in the pasta pan. I usually add the mushroom-spinach mixture first and make sure it’s evenly stirred through, before pouring on the velvety cheese sauce and mixing everything together. Tip into an oven proof dish, sprinkle over the remaining cheese and then grill until the cheese is browning and the dish is piping hot throughout.